I have to confess to a small giggle of excitement on opening today’s Advent calendar door. I’m a huge Islay fan (as you may have noticed!) 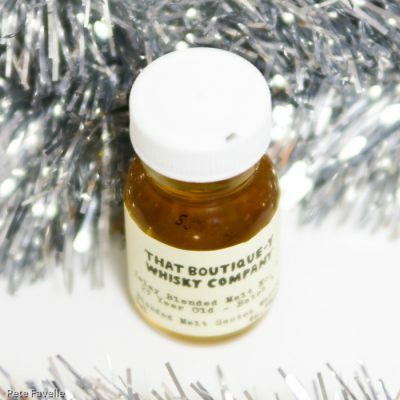 and if this year’s calendar has taught me anything, it’s that the folks at That Boutique-y Whisky Company know a thing or two about how to create amazing blends. So my hopes are high for this one! Islay Blended Malt No. 1 23 Year Old Batch 1 (phew!) is unusually well defined for a blend; 60% Ardbeg, 35% Laphroaig and 5% Bowmore, all at least 23 years old. It’s a nice golden colour, and bottled at an approachable 46.3% ABV. The nose is pure Islay; cold smoke, TCP and sea spray. There’s a hint of cooked cabbage lurking underneath, and overtime just a touch of caramel appears. Watered, the smoke is softer and peatier along with sweeter note of lime jellies – when I saw Jelly Babies mentioned in the tasting notes I thought they’d overdone the sampling but it’s spot on – and a little coconut milk right at the end. In the mouth it’s singed gingerbread, sherry-soaked raisins and a slightly ashy finish. With water, the spiced ginger comes through stronger, and some oak tannins arrive too. The finish lingers like a log burning stove, heating you from the inside out. It’s very nicely balanced and pure Islay; the majority contribution from Ardbeg comes through loud and clear, but it’s not as ‘shouty’ as I find Ardbeg can sometimes get. It doesn’t have quite the depth or complexity I was hoping for given the age, though, so only 3.5 stars. It would be interesting to see a blend from the other side of the island now!